Cosmetic dermal fillers are substances that are injected just below the surface of the skin to fill in lines, wrinkles, scars, and restore facial volume. 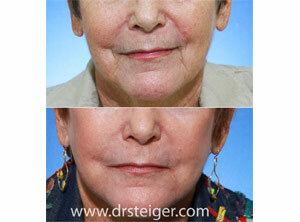 Dermal fillers produce remarkable results with minimal to no downtime. The treatments are comfortably performed in our office. Dermal fillers can be used to improve the nasolabial folds (smile lines), marionette lines, cheek hollows, cheek creases, chin creases, frown lines, mid-face, and hollows under the eyes. Targeting specific areas of your face, dermal fillers can take years off of your appearance. Which injectable filler should I use? There are many available facial fillers on the market that can be used. Each filler has unique properties that make it best in certain areas of the face. A facial plastic surgery expert can help determine the best filler for you based upon your appearance and your goals. Fillers are commonly used to improve the nasolabial folds (smile lines), marionette lines, cheek hollows, cheek creases, chin creases, frown lines, temples, mid-face, and hollows under the eyes. Targeting specific areas of your face, dermal fillers can take years off of your appearance. Choosing the best filler is part of the art of performing facial filler injections. Dr. Steiger combines his extensive knowledge of facial fillers, advanced injection techniques, and artistic eye to achieve the best possible results. What are the different types of filler? Restylane, Perlane, Juvederm, Voluma and Boletero are examples of dermal fillers made of Hyaluronic Acid. Hyaluronic Acid is a natural molecule that you have in your skin. They do not come from animals and are made in a laboratory under sterile conditions by large pharmaceutical companies. The most important difference between the fillers is how thick they are. Radiesse is another type of a filler that is made from calcium hydroxyapatite in a gel carrier. This is thicker then many of the other fillers and for this reason works very well in the cheeks and for very heavy facial folds. Voluma is a newer hyaluronic acid filler that is thick enough to give similar results to Radiesse. Yes. 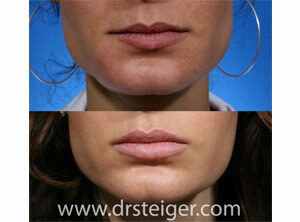 Dr. Steiger uses certain fillers for lip augmentation, achieving remarkable results through his technique. He takes pride in creating proportionate, natural appearing lips. Please visit our lip enhancement section. Yes. 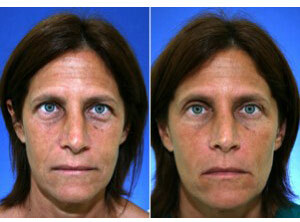 Fillers can be used to correct the depressions that form beneath the eyes. The hollow area close to the nose is called the tear trough. Dr. Steiger’s unique technique can restore a more youthful appearance to the region underneath the eye, such as the tear trough, as well as the outer portion of the lower eyelid. Dr. Steiger performs filer injections underneath the eyes in some instances to delay the need for a surgical procedure, as well as to fill in the lower eyelid / cheek area when to much fat was removed in a prior lower lid blepharoplasty. For this reason, he rarely removes fat when performing lower eyelid surgery. A cosmetic filler’s longevity depends upon the type of filler used and your body’s response to it. The majority of fillers last from 6 months, up to 2 years. Injectable fillers can be repeated as often as you like to improve or restore the correction. Cosmetic filler treatments are performed by placing small injections into specific areas. Dr. Steiger utilizes a variety of special injection techniques to minimize discomfort. Topical and/or local anesthetic can also be used to provide greater comfort. We only use the highest quality/grade of medical equipment in our office. Most patients are pleasantly surprised by the minimal discomfort from the procedure. There are many dermal fillers on the US and international markets. Dr. Steiger believes that safety is of the utmost importance and will only inject products which are FDA approved for safety. All products are purchased directly from the manufacturer, ensuring the highest grade and reliability.